Bacterial site-specific DNA-endonucleases (restriction endonucleases, RE) and DNA-methyltransferases of the same specificity form so-called restriction-modification systems (RM-system). Nowadays there are more than 250 different recognition sequences of type II restriction endonucleases (prototypes) and more than 3500 characterized enzymes (isoschizomers). Isoschizomers have an identical recognition sequence but may differ in ability to hydrolyze methylated site. There are only a few examples of such isoschizomers pairs (EcoRII - MvaI [6,7], HpaII-MspI ), which recognize DNA sequences 5’-CCGG-3’ and 5’-CC(A/T)GG-3’, respectively, and are used in study of natural DNAs methylation status [1-5,16]. A well known RE AluI from bacterial strain Arthrobacter luteus recognizes and cleaves sequence 5’-AGCT-3’ . This enzyme has found a wide practical application in biotechnology and molecular biology and has become one of the most popular restriction endonucleases. AluI RM-system includes DNA-methyltransferase, that methylates recognition sequence 5’-AGCT-3’ in position C5 . Such modification prevents DNA from hydrolysis by restriction endonuclease AluI. In the present work we describe isolation and substrate specificity of a new restriction endonuclease AluBI, which is capable to cleave both non-modified DNA and the recognition sequence 5’-AGCT-3’ with 5-methylcytosine(s). Reagents manufactured by Sigma (USA), Serva (Germany), ICN (USA) and Helikon (Russia) were used in the work. Colonies Arthrobacter luteus B were grown on LB agar at 30°C and were transferred into the flasks, which contain 300 ml of liquid LB medium. Flasks were cultivated in shaker (New Brunswick Scientific USA) two days at 30°C. The cells were precipitated by centrifugation for 30 minutes at 5000 g in J2-21 centrifuge (Beckman, USA) and were frozen at -20°C. Enzyme isolation was performed at 4°C. Frozen cells (37 g) were suspended in 100 ml of the buffer A (10 mM Tris-HCl, pH 7.5, 0.1 mM EDTA, 7 mM 2- mercaptoethanol), containing 0.05 M NaCl, 0.3 mg/ml lysozyme, 0.1 mM phenilmethylsulfonyl flouride (PSMF). The suspension was incubated during 1 hour with permanent mixing and then cells were disrupted by ultrasonic treatment as was described earlier. The cell debris was removed by centrifugation at 15000 rpm for 30 min. Supernatant was applied on column with 45 ml phosphocellulose P-11 («Whatman», England). The column was washed with buffer A containing 0.05 M NaCl. 0.05-0.6 M NaCl gradient in buffer A (500 ml) was used for enzyme elution and 10 ml fractions were collected. 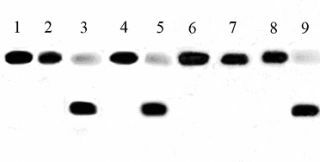 The elution fractions with endonuclease activity were pooled and dialyzed against 20 volumes of buffer A.
Dialyzed fractions were applied on 7 ml heparine-sepharose column («Bio-Rad», USA). Elution was performed using 0.05-0.5 M NaCl gradient in buffer A (120 ml) and 3 ml fractions were collected. The fractions with enzyme activity were combined and applied on 4 ml column with hydroxyapatite (BioRad, USA). The enzyme was eluted with K2HPO4 gradient, 2 ml fractions were collected and analyzed. Fractions with a high enzyme’s activity were pooled and concentrated by dialysis against 20 volumes of 50% glycerol, 10 mM Tris-HCl, pH 7.55, 0.1 mM EDTA, 7 mM β-mercaptoethanol, 0.05 M NaCl. Purified enzyme was stored at -20°C. A total of 2.5 ml of enzyme preparation with the specific activity of 5000 u/ml were purified. Restriction endonucleases AluI (concentration 3000 u/ml), AluB I (concentration 3000 u/ml), T4 polynucleotide kinase and buffer solutions manufactured by SibEnzyme (Russia) were used for experiments. Following oligonucleotides, served as substrates for endonucleases Alu I and AluB I, have been synthesized at SibEnzyme Ltd. (Russia). Oligonucleotides with even number are complementary to oligonucleotides with odd number. All oligonucleotide duplexes have identical primary structure and differ from each other by a presence or an absence of the methylated bases in sequence AGCT (sequences AGCT recognized by AluI and AluBI, are underlined). One of the chains of oligonucleotide duplex was labeled at 5’-end using T4-polynucleotide kinase and γ-[32P]ATP. After oligonucleotide purification, complementary unlabeled oligonucleotide was added, the tube was heated at 95°C for 5 minutes followed by cooling to room temperature on the bench. The hydrolysis reaction was carried out in optimal conditions (37°C, SE-buffer Y - 33 mM Tris, acetate pH 7.9 (at temperature 25°C), 10 mM Mg (CH3COO)2, 66mM KCH3COO, 1mM DTT) by addition of 1 μl (3 units) enzyme AluI or AluBI in 20 μl the reaction mixture containing the oligonucleotide duplex in concentration of 66,7 nM. Reaction time is 50 minutes. Products of the oligonucleotide cleavage were separated by electrophoresis in denaturing 20% polyacrylamide gel (PAAG) with 7 M urea. Strain forms white, smooth, brilliant, opaque, convex, round colonies of 4 mm in diameter on Luria-Bertrani medium. Cells are coccus-shaped, single, in pairs or in short chains have 0,8-1,2 microns diameter. Bacterial cells are Gram-positive, not capable to anaerobic growth, catalase-positive, oxydase-nagative. The strain grows at temperature 10-40°C. The guanines and cytosines percentage in a host DNA 73-77 % was established according to . Strain was identified as a bacterial species Arthrobacter luteus B. Restriction endonucleases was named AluBI according to the standard nomenclature . Specificity of enzyme was determined by comparison of λ and T7 bacteriophages DNAs digestion patterns (fig. 1). Fig 1. Digestion of λ and T7 DNA with AluI and AluBI restriction endonucleases. Reaction mixtures containing DNA at concentration 0,02 mg/ml, enzyme in SE-buffer Y (33 mM Tris-acetate, pH 7,9, 10 mM MgCl2, 66 mM potassium acetate, 1 mM DTT) was incubated at 37°C for 60 minutes and was separated by electrophoresis in 1 % agarose gel. As shown on fig. 1 λ and T7 DNA hydrolysis with AluI and AluBI produces a similar DNA digestion fragments of identical length have appeared as a result of the bacteriophages DNAs treatment with patterns. So, AluBI recognize and cleave DNA sequence 5’-AGCT-3’. Comparison of DNA fragment lengths, which formed during cleavage of oligonucleotide duplexes Alu1*/Alu2 and Alu2*/Alu1 (labeled strand is marked by a symbol <*>) was carried out. These duplexes have non-methylated recognition sequence 5’-AGCT-3’. 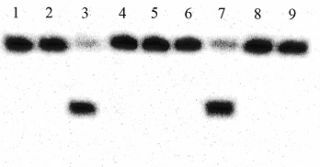 Products of partial hydrolysis of the same duplexes with exonuclease ExoIII were used as a fragments length marker. Results of oligonucleotide duplexes digestion are presented on fig. 2. Fig. 2. Determination of DNA cleavage positions of restriction endonuclease AluBI. As shown on fig. 2, lengths of the fragments, which are produced by the cleavage of oligonucleotide duplexes Alu1*/Alu2 and Alu2*/Alu1 with both enzymes, are identical. Thus, the restriction endonuclease AluI and AluBI cleaves the recognition sequence in the same way, producing blunt ends. Results of methylated and non-methylated synthetic oligonucleotide duplexes digestion are presented on fig. 3-5. 6 - duplex Alu1*/ Alu6, RE AluI;. Results of AluI and AluBI hydrolysis of oligonucleotide duplexes containing recognition sequences without the methylated bases or with only one methylated base (semi-methylated site) are presented on fig.3. AluI and AluBI hydrolyze the oligonucleotide duplex containing the non-methylated recognition sequence (lanes 2, 3) and do not cleave DNA with methylated adenine (lanes 4, 5). In presence of C4 and C5 methylated cytosine in complementary strand, AluBI hydrolyzes unmodified strand (lanes 7, 9) whereas AluI does not (lanes 6, 8). Data on AluI and AluBI hydrolysis of the oligonucleotide duplexes, which contain 5-methylcytosine or N4-methylcytosine in the labeled strand of recognition sequence, are presented on fig.4 and on fig.5, respectively. According to the data on fig. 4 AluBI hydrolyzes methylated strand if complementary strand is unmodified (lane 3) or contains 5-methylcytosine (lane 5); however AluI does not cleaves such methylated DNA (lanes 2, 4). Thus, AluBI, unlike AluI, hydrolizes both strands of DNA in the presence of one or two 5-methylcytosines in the recognition sequence. However, the strand with 5-methylcytosine is not hydrolized with AluI and AluBI if complementary strand contains N6-methyladenine (lanes 6, 7). Finally, AluBI, unlike AluI, cleaves the strand with 5-methylcytosine in the presence of N4-methylcytosine in complementary strand (lanes 8, 9). As shown on fig.5 AluBI, unlike AluI, hydrolizes the strand with N4-methylcytosine in recognition sequence if complementary strand is not modified (lanes 2 and 3). However, both AluI and AluBI do not cleave oligonucleotide containing two N4-methylcytosine in the recognition sequence (lane 4, 5). Thus, AluBI, unlike AluI, is able to hydrolyze DNA if the recognition sequence contains only one N4-methylcytosine. The labeled strand with N4-methylcytosine is also hydrolyzed by AluBI, but not AluI if the complementary strand of recognition sequence contains 5-methylcytosine (lanes 6 and 7). At the same time, as one would expect, both enzymes does not cleave oligonucleotide if its structure contains N6-methylcytosine (lanes 8 and 9). Thus, unlike AluI, restriction endonuclease AluBI is capable to cleave a recognition sequence 5 '-AGCT-3 ' if one or two cytosines in position C5 or one cytosine in position N4 are methylated. Bacterial DNA of strain Arthrobacter luteus , which is a producer of AluI restriction endonucleases, contains 5-methylcytosine in a sequence 5 '-AGCT-3 ' . 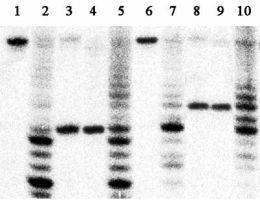 On fig.6 we have presented data on the cleavage of Arthrobacter luteus DNA with AluI and AluBI. According to data provided on fig.6 AluI doesn’t cleave DNA, whereas AluBI cut this chromosomal DNA very well. Because of various sensitivity of enzymes AluI and AluBI to C5-methylation of the recognition sequence, this restriction endonucleases can be used for determination of the modified bases in sequence 5 '-AGCT-3 ' in chromosomal DNAs. AluI and AluBI may be used for determination of DNA methylation status for eukaryotic genomes. The presence of 5-methylcytosine in DNA, as a result of CNG and CT methylation, is shown for some eukaryotes [15,16]. In this case, due to partial or full overlapping these methylation sites with sequence 5'-AGCT-3 ', AluBI is able to hydrolyze the modified recognition sequence whereas AluI is not.